I have a lot of admiration for my daughter Sidney, who is five years old. I have never met a more naturally kind person — she is always looking after her little sister Riley, who can be a handful, and she makes close friendships at a young age with both other children and adults. Sidney’s wonderful little girlfriends at her preschool — Reagan, Sammy, Kendall, others too — have been a great gang at school for the past year in Ms. Theresa’s class. Now, they are all heading off to different schools for kindergarten. I have been amazed at the maturity Sidney and her friends have shown through this dramatic transition. They are leaving their friends behind and going to completely different worlds, and they really love each other, but they are handling the transition better than most adults would. They show true friendship and an appreciation of both the friendship and the upcoming change: For the last few weeks of school, whenever I would arrive with Sidney at preschool, her wonderful little friends would all yell “Sidney!” and they’d all run and hug each other, as a group and then one by one. Then they’d play. They would talk openly to me about the different schools they were going to and say they wanted to have playdates. I thought Sidney would be distraught over this — leaving her friends, her preschool of the last two years, her teacher who she adores — but she has been an absolute champ. I have asked her several times about her feelings about changing schools, told her I would love to talk to her about anything that might scare her about it, and leading up to school, she’s repeatedly said: ”I’m gonna miss my friends and Miss Theresa, but I’m excited about going to kindergarten.” And she’s totally sincere. I am so proud of her confidence — my big girl knows that her new teacher will appreciate the person she is and that she will make friends. She knows it. I remember, over three years ago, when we started our first preschool in California, Sidney was very nervous and shy and serious. Not anymore. She’s composed and confident. She truly inspires me to be more poised and confident in challenging situations. She knows she can handle it, and she’s only five. I think of her when I’m nervous about anything — which admittedly is not too often — and it makes me smile and relax. So… The first few weeks of elementary school have gone great. Sidney doesn’t have super close friends there yet, but she is game to go every morning (three days a week for kindergarten). She has had concerns about the bus that have been difficult to pin down — she likes the bus, but somehow she has seemed afraid that she’s going to miss the bus on the way home or that I don’t know where the bus goes when she’s on it. So we solved that problem together: I followed the bus in my car, both to school and from school one afternoon, and then we talked about everything about the trip. Now she seems more relaxed about it — I think because I know all the places she’s gonna be — and I’m glad she told me about her concern. And I left her room, thinking: Even on Sidney’s worst night, when the weight of a world-changing transition is suddenly hitting her, when she doesn’t understand her own emotions of fear and anxiety, when she thinks she’s sad about the tub but she’s really sad about something so much larger — having to change her school, her circle of friends, her methods of transportation, her five year old comfort zone — even then, this extraordinary girl with a heart of pure love and courage will look up at me after pretty much her longest cry ever and tell me that she just wants me to know that I’m the greatest. How many people will ever give you that kind of love? I’m the luckiest man in the world. It’s Independence Day! That’s July 4th for those of you who are not American history scholars. And as a father of two wonders and husband of an additional wonder, I can tell you in no uncertain terms that while independence has its merits, it is certainly not all that it was cracked up to be by our Founding Fathers. If I was independent of my three babes, my life would be far less meaningful, far less rewarding, far less loving, and far less fun. Today we are going to our city’s Independence Day parade and celebration, and then Sidney and daddy are going on a dream date to see the Colorado Rapids (the local Major League Soccer team) play in their beautiful brand new stadium. After the game will be a giant fireworks show. Sidney and I went to the July 4th game last year too. Sidney’s on a soccer team now and truly shares her daddy’s love of soccer — both playing and watching it. That is so awesome. God I love that girl. Riley will come to the games in future years too when she’s older. Returning home at 11 PM is probably still a stretch for Riley. Our love of soccer segues into a story I would like to share with you. This is a soccer story. It is also a “man wearing a pink princesses shirt” story. And it is a story of betrayal. So listen up Coach Steve: I’m calling you out! But don’t worry, I’ll still be your assistant coach next season. I’m just that big a guy. Our story starts on Sidney’s first day of soccer practice. She has joined a team for the first time (at age five), and I have volunteered to be her assistant coach. Once upon a time, I was quite the ambitious soccer guy. I was a successful high school varsity boys soccer coach for three years. Before that, I was actually on the varsity soccer roster at Stanford for a time, a distinction I enjoyed obtaining more than I actually enjoyed playing on the team, which was very time consuming and prohibited me from the proper time to chase music and girls in college. So I retired early from college soccer. 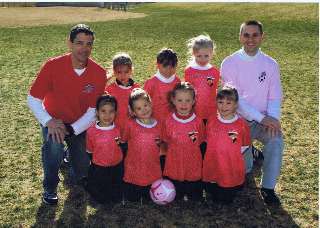 At this point, my job as an assistant coach for the Pink Princesses consisted entirely of showing up most of the time to practices and games and doing whatever Coach Steve told me to do. And I was very fond of that level of job responsibility. Anyway, on Sidney’s first day of practice, Coach Steve’s wife gave every girl a pink T-Shirt that had a soccer ball and the words “Princesses” on it. Also, the image of the soccer ball had a pink crown on it. A nice touch. Practice jerseys. Cool. The girls loved them. Oh my god did they love them. Then came the unexpected: She pulled out two adult size pink princesses soccer shirts. One for me and one for Coach Steve. ’Okay,’ I thought, I’m dedicated enough to my girls and comfortable enough in my incredibly pronounced masculinity to take one for the team and wear a pink princesses shirt that is several sizes too big for me — thus emasculating me in just about every conceivable way — in public. Coach Steve put his on. Hey, I thought — if Coach Steve is gonna wear his, I’m gonna wear mine. No problem. So each Wednesday night for practice, and each Saturday night for games, I could be found prancing about in public in my pink princesses T-Shirt. Coach Steve did too. We always wore our pink princesses shirts. I got quite used to this. Unified in our selfless support of our girls. Our family would often stop at the Whole Foods Market, that Lola Granola haven of grocery stores, on the way home from games on Saturday to get groceries and have lunch, where I would proudly don the pink princesses shirt I was swimming in for all to see. No problem. I didn’t even take it off between the game and the grocery store. I waited until we got home. Because I’m such a man. And now for the betrayal: picture day. We show up on the morning of the game that team pictures are being taken. It’s a bitterly cold Colorado winter morning; everyone’s wearing coats, hats, and mittens until the last possible moment before the pictures. Our team gets up to the photographer. Time for the team photo. The jackets come off and we all rush to the team photo spot. The girls are all wearing their game day uniforms. I am wearing my gigantamongous pink Princesses shirt the coaches always wear to practices and games. Last thing, Coach Steve takes off his big jacket and sits down on the other side of the picture from me beside the girls… in a very manly and perfectly fitted red collared shirt with a macho official soccer coaching logo on it. What? my mind is thinking as the photographer tells us to look forward and smile for the picture in the frigid cold thirty degree temperature. “Steve, where’s your pink princesses shirt?” I ask him immediately after. “Oh, I um, forgot it,” he says with a sincere lack of conviction, after approximately ten straight appearances in the pink shirt. The referee blows the whistle. We start the game. I am on an unplanned vacation this week due to girls with bronchitis and wheezing and the 527 doctor’s appointments and trips to the pharmacy associated with said bronchitis and wheezing. So I am taking a week off from the blogs. I’ll be back next week — hopefully with tales of vanquishing bronchitis and wheezing. Wish me luck!